This recent change is in line with the traffic numbers provided from Alexa. But this isn’t the reason why we published this article. 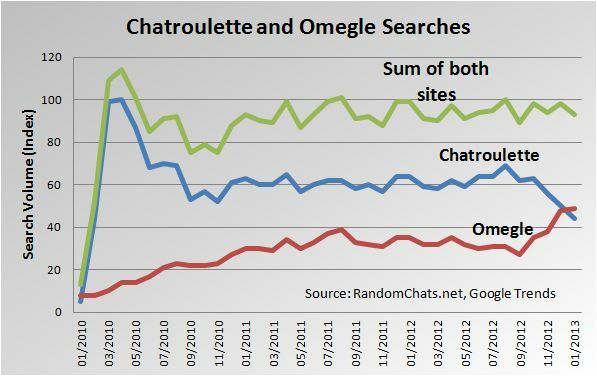 The idea behind the above diagram was to show whether the popularity of such random chat sites has remained stable or if it has dropped after the initial hype in spring 2010. As you can see in the green line – the sum of the search traffic for Chatroulette and Omegle – the traffic has remained very constant for the past 2 years (since spring 2011). Now this is amazing, at least for many people used to such internet and social media hypes. Usually the are very popular during a few days or weeks, and then such sites disappear without much notice in public. This is not true for these videocam chat sites. And this is also not just a regional trend, e.g. in the US or in Russia. When looking at the Alexa popularity in various countries, we can see that Omegle is most popular in Turkey, India, UK, Canada and in the United Stats. On the other hand, Chatroulette is most popular in Algeria, Tunisia, Italy and Turkey. So meeting strangers online in order to have a video chat is them has become a global trend. And as the above graph shows, this trend will probably last for another few years. Are you a long-time user of random chats? Please share your opinion with other readers of this website on how you think that these sites have evolved over the past three years.